The Loughborough Farm is a community food growing project in Loughborough Junction. The Farm is well attended and goes from strength to strength since its launch in August 2013. We are in the process of building a network of growing spaces around Loughborough Junction on pieces of land that are currently derelict or underused. The food grown will be for local consumption. We are currently running a Loughborough Farm stall selling our on the first Saturday of each month. We provide horticultural training and we encourage our volunteers to take up opportunities for accredited training that could lead to employment. 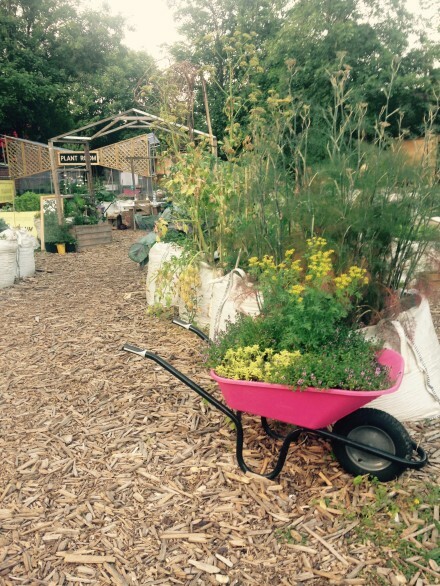 Loughborough Farm is open Tuesdays from 1-3pm and Saturdays from 1-3pm. Check out our event postings page or our noticeboard outside the gates. Alternatively you can join our Loughborough Farm mailing list to receive regular updates on what is happening at Loughborough Farm. Email loughboroughfarm@gmail.com. As a volunteer you can help on a drop-in basis or more regularly. If you want to make a regular commitment, think about becoming a Grow Leader. Email Emily to find out more. We grow food together rather than people having individual plots. Regular volunteers take fresh vegetables home with them after every session. Loughborough Farm, The Triangle, Loughborough Road, opposite Wyck Gardens and the Platform. We planted a community orchard in Wyck Gardens which we are helping to look after. See photos of our work on the farm on our Flick pages here and here.